This is just a peak into what my 1st week on Atkins 40 looked like, I mean 1st because it really is a great way to help you eat and maintain a healthy diet, so this girl plans on keeping up with the Atkins 40 diet. Notice from my notes above that I got to eat a nice healthy amount of meats. Plus, I still got to keep quinoa in my diet. and that made me jump for joy. 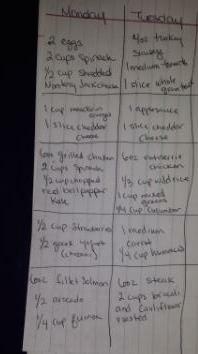 This girl loves her rice, that has been one of the hardest parts when trying diets. The Atkins has you eating lots of fruits and vegetables along with healthy doses of meats. This is what my snacks looked like (an example of meal plans can be found online at the Atkins website) I replaced half an apple for some applesauce because I was able to take some from my munchkins stash. We buy a lot at Costco so he can have healthy snacks at hand. 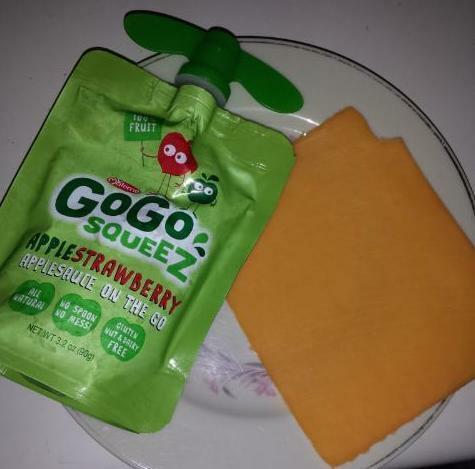 So, applesauce and a slice of cheddar cheese it was. 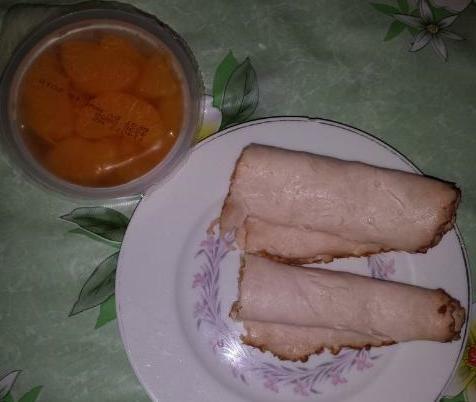 Another idea of snacks was a cup of mandarin oranges and two rolls of turkey - barbeque turkey - yummy! The beauty of having kids in your life is that you get to share their yummy treats! No starving is involved with Atkins 40, you seriously end up eating a lot and most of the time I felt full by the time it was time to eat dinner. I am still able to eat some bread, quinoa, sweets in the form of fruit and other yummy, healthy items. It's been a very stressful and hard week for my family and I, a family emergency came up and i wasn't able to take more pictures of my foods like I would have liked, but I'm hoping to do things more properly as soon as things calm down, so make sure to follow me on Instagram @RunChiquitaRun as I continue on this Atkins 40 journey! This post is sponsored by FitFluential on behalf of Atkins.